How much does it cost to travel to Halong Bay? How much money will you need in Halong Bay? d739,466 ($32) is the average daily price for traveling in Halong Bay. The average price of food for one day is d90,960 ($3.92). The average price of a hotel for a couple is d916,354 ($39). Additional pricing is in the table below. These average travel prices have been collected from other travelers to help you plan your own travel budget. How expensive is Halong Bay? Halong Bay is a UNESCO World Heritage Site in the north of Vietnam, near the Chinese border. Known for its thousands of beautiful limestone karsts and stalactite-filled caves, it is one of the most visited destinations in Vietnam. If you appreciate natural scenery and want an adventure at sea, you'll love cruising among more than 1,900 islands in Ha Long Bay. The best time to visit Ha Long Bay is between March and June, but if you want to skip the crowds, go from June to September, which is low season for travel so you'll be able to save some cash. High season hits again between October and November. December through February is another low travel season to avoid crowds, but be prepared for cloudy, cold, and rainy weather, which may likely obstruct optimal views of the karsts and bay. Cat Ba Island is the largest in Ha Long Bay and known for its national park, where the endangered langur lives. If you decide to visit, be ready for crowds. Hiking, mountain biking, and exploring Monkey Island are just a few of the many activities on Cat Ba Island. Visitors can also relax on the private beaches at the Monkey Island Resort, climb the karsts, or go spelunking in the numerous nearby caves. Even if you don't visit Cat Ba, there are plenty of other islands for you to explore caves, climb rocks, kayak, and even swim in hidden lagoons. Sung Sot Cave and Dau Go Cave are well-lit with colored lighting. Visit the Cua Gan, the largest of the four floating Villages, to get a glimpse into the life of local fishing families. Check with tour companies to find out which islands they will visit to plan your activities. Some popular islands include Dau Be Island, which is on the cruise to Cat Ba and great for swimming and diving, Bo Hon Island, known for the famous Virgin Cave containing a shrine to a woman who committed suicide, and Quan Lan, a historical island featuring lovely beaches. Check out Tung Sau to visit the oyster farm and learn about the pearl industry in Vietnam. When it comes to traveling through Halong Bay, your fine or humble dining and cuisine will ultimately depend on your cruise boat. However, if you have the opportunity to find a restaurant on land or are simply feeling adventurous, there are a number of local specialties you may be interested to try. Tu Hai is a rare shellfish and is the regional specialty of Van Don Island. Also known as "snail spout," it can be enjoyed steamed, baked, or in a soup or salad. Sa Sung, a sandworm, is another Ha Long delicacy you can expect to pay a pretty penny for. Enjoy it stir-fried with leeks and celery or fried, as a snack alongside your beer. The Gieng Don and Cao Xanh districts in Ha Long are well-known for Sam, an arthropod crustacean which are deliciously prepared in a variety of different ways: steamed, fried, grilled and stir-fried, to name a few. 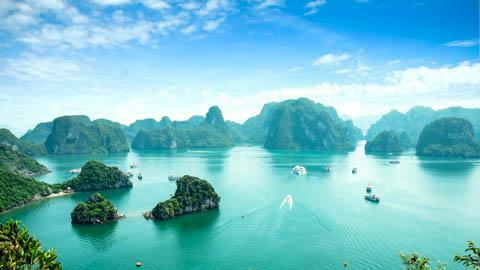 Most cruises leave from Hanoi and Ha Long City and can last from one to four days. There are several modes of transport to get to Ha Long Bay. The cheapest option is to take a 4-5 hour ride on a minibus from Hanoi, which will make stops to pick up additional passengers. For a quicker and more comfortable ride, take a bus from My Dinh Bus Station in Hanoi. It will cost more, but what you spend in money, you'll make up in time. Once at My Dinh Bus Station, take a motorbike to the Tuan Chau Wharf. You can also take the cargo train from Hanoi to Gia Lam and then to Quang Ninh. The ride will take about 6.5 hours and starts at 4:30 a.m. You'll arrive near the Bai Chay bus station in Ha Long City,just 5 km away from the harbour. However, trains are often delayed and cancelled without notice, so you may want to opt for the train on the day of, just to be sure. If you're coming from the airport or simply prefer a more flexible means to get to Ha Long Bay, hire a private car or a taxi. It is much more costly, but will afford you a comfortable ride at your own pace. If you're coming from Noibai, you can opt to take the seaplane to Halong, which will take just 45 minutes and you'll experience a water landing right on the Tuan Chau Island Marina. You can also request and extra 15-minute scenic tour to check out the area.